outdoorsportsstores has no other items for sale. I have used Blackhawk brand before during my deployment in Iraq 2004 and 2005 back to back. I especially bought one for the 9mm which work well in adverse condition while my tour in Iraq. Now that I am retired from the US Army I bought this for my Glock 27 and fit just fine. Blackhawk brand has serve me well during my tour and I am sure this purchase will do just the same. Nice holster. Good design just be sure to practice with your hand placement and release of the latch. Muscle memory is important for a consistent release and presentation of the weapon. For over 20 years I used a Fobus holster for my Glocks with confidence. I didn't need any retention features since I was working protection details not court duties. Now that I changed weapons I needed a new holster. A colleague suggested the Blackhawk and demonstrated his. I liked the index finger being the focal point of the retention system. It was an easy transition from the Fobus to the Blackhawk. Having the two holster options (paddle or belt loop) is nice as well. The construction is solid even though I've used it on the range once. It is well worth your time and effort to try it out. 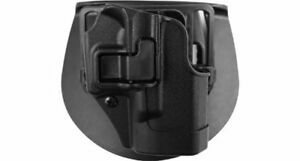 Great holster- holds gun secure and is lightweight but sturdy. Fits perfect. Easy to use. Retention clip holds securely, but easy to release when drawing.